An exotic species is a species found outside of its natural range or one that is historically not native to an area - one that readily invades other biotic communities, disrupting community function. Invasive species can pose a serious threat to the biological diversity of an area. The participants in the 1999 Natural Areas Techniques Forum in Tucson identified invasive exotic species as the number one stewardship concern in natural areas. They felt that the NAA needed to expand its role as a venue for presenting and developing information on exotic and invasive species, and kicked off an effort to gather all information on the topic that had been published in the Natural Areas Journal. 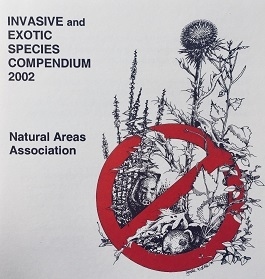 In October 1992, NAA published the original compendium of 43 articles on exotic species from the first eleven volumes of the Natural Areas Journal - later expanded to 93 articles published through the end of 2001. The articles can be located under eleven separate topics listed in the table of contents. References in the articles have been combined to form a bibliography on exotic and invasive species (and related topics) including an estimated 1750 entries. The Management and Technology Development Committee and the Board of Directors of the Natural Areas Association would like to acknowledge the authors whose articles contributed to the Natural Areas Journal are included in this work. This compendium would not be possible without their support of the Natural Areas Journal. We also want to recognize the past and present editors, members of the Editorial Board, editorial staff of the Natural Areas Journal, and the Dr. Charles E. Williams and Laura M. Cotterman, who were serving the Journal as Editor and Managing Editor during the time this Compendium was assembled. We acknowledge the current publisher of the Natural Areas Journal, Allen Press. We also thank the United States Bureau of Land Management for its financial support of this project. Special thanks to Reid Schuller, past Executive Director of the Natural Areas Association and Barbara Ver Steeg, the compiler of this revised compendium, for their diligent work. S.D. Hight and J.J. Drea, Jr.
S.C. Rooney, C.S. Campbell and G.L. Jacobson, Jr. Selective control of crested wheatgrass (Agropyron cristatum [L.] Gaertn. and A.